The M697 Chime 12 Hybrid King 12" Hybrid Mattress and Foundation by Sierra Sleep at Pedigo Furniture in the Livingston, Onalaska, Trinity, Coldspring, Corrigan, Huntsville, TX area. Product availability may vary. Contact us for the most current availability on this product. M69741 King 12" Hybrid Mattress 1 12"
Edge Support Two Perimeter Rows of 9" 13.0 Gauge Pocketed Coils for Edge Support. The Chime 12" Hybrid Mattress provides you with a quality, value priced mattress. Supported with Individually Pocketed Coils, including two perimeter rows of sturdy pocketed coils for additional edge support, provide adaptable support that forms to each individuals shape. 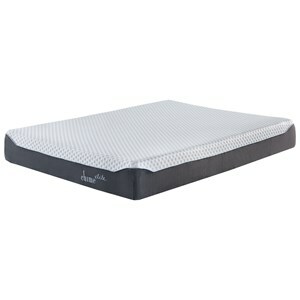 High Density Gel Memory Foam in the center third for additional Lumbar Support. A very good mattress for a guest room or price conscious shopper. This mattress ships compressed in a smaller box making it easy to transport. The M697 Chime 12 Hybrid collection is a great option if you are looking for Mattresses in the Livingston, Onalaska, Trinity, Coldspring, Corrigan, Huntsville, TX area. Browse other items in the M697 Chime 12 Hybrid collection from Pedigo Furniture in the Livingston, Onalaska, Trinity, Coldspring, Corrigan, Huntsville, TX area.